These search terms are what are matched to your keywords and it is this that triggers your ads to show. We describe the features and workings of search terms in this guide. Search Terms and Search Queries are interchangeable phrases that both describe the same thing. Keywords are the objects in an AdWords account that are matched to search terms and hence trigger ads to show in the SERPs to users / searchers. Thus for each keyword there are a range of potential search terms that could be matched and hence trigger an ad, we describe this process of matching search terms to keywords below. Google has become very good at determining user intent based on their vast amounts of data, they can predict with statistical certainty that when a user searches for something, what they are looking for. Google use this to help match searches with keywords. A good example of this, is if you search for something and include a misspelled keyword. We discuss each of these in more detail in a guide to keyword match types. AdWords provide us with a tool specifically to look at search terms that both triggered ads and resulted in a click of one of your ads in the ‘Search Term Report’. This is an important distinction, because search terms that do not eventuate in a Click of your ad will not show in this report. Thus you cannot see the search terms that didn’t result in a click. The Search Term report can be seen by navigating to the keywords tab, and then clicking the “search term” button as shown in the image below. You can see search terms for the whole account, a campaign or an ad group, depending on what is selected in the directory list to the left of AdWords. You cannot see Search Terms within AdWords Editor, only within the online tool. We cover how to use Search Term reports for account expansion in another guide. This is the search term that triggered the ad and resulted in a Click. The match type in this report is the ‘effective match type’ rather than the match type of the keyword that triggered the ad. For example if someone searched for “blue dresses” and your broad match keyword “blue dresses” triggered the ad, this would show as “Exact Match” in the match type column in the search term report. These are search terms that already exist within the account as a keyword and are hence “added”. These are search terms, which have been added as a negative keyword, thus excluding them from triggering ads in the future. This refers to search terms that were matched to a keyword in the account but that does not exist in the account ‘as is’. Here we discuss some concepts and theory behind search terms; there are essentially three main categories. Within each category there are two sub-categories of search term, which we classify as ‘head terms’ and ‘long-tail’. These terms are defined in Wikipedia and are by no means exhaustive; you can read what Wikipedia say here. A navigational search term is one where the user is typically trying to find their way back to something previously visited by them. Often people type in URL’s or things like “YouTube” into Google to find a website rather than navigating there directly. Hence this type of query has very low commercial value to most businesses, except where you own the business or website being searched for. There are cases where a business provides similar services to another better-known business and in this scenario they may target this type of search term. Due to restrictions on the use of trademarked terms in ad copy, this type of bidding / keyword strategy is often costly and less effective than targeting other types of search term. Bidding on navigational search terms relevant to your business and / or website is a good strategy. This ensures that your ads are showing to users who are looking for you. This often protects the top position, rather than losing it to a competitor and is usually very cheap by contrast to transactional search terms. Typically these are search terms that cover a broad topic and are much harder to monetise for most businesses. More often than not people using informational search queries are looking for facts or answers to questions that may not be relevant to a product or service. The best way to address this type of query is to use targeted SEO content; this allows you to rank organically for these types of terms rather than pay for the traffic. That said, if you have identified this type of search term as being part of a path to purchase or conversion funnel… You may attribute some value to it, as meeting this user need creates a touch point for your brand. A good example of this could be someone searching for “Les Gets” which is a region of France famous for its ski chalets. Although a broad and non-specific term, people Googling this have a high chance of being interested in either skiing or staying there. Having a dedicated landing page addressing the needs of the searcher at this stage creates a touch point for your brand and could encourage return visits. It is also possible to remarket to these people with relevant seasonal ads. If, how and when you target these terms will depend entirely on the term itself, and the ability of your business / website to meet the needs of the searcher and monetise the search term. There is a clear high value to search queries that could fall under this category, as they are the people that businesses typically want to target. The above descriptions of the three categories of Search Term are how Wikipedia and some other organisations like to describe them. However there are many ways to cut, segment and categorise search terms. We more typically look at keywords as being part of a conversion funnel or a path to purchase. We cover this in more detail in a guide “An Introduction to conversion optimisation”. We cover the conversion funnel aspect of conversion optimisation in brief detail here. 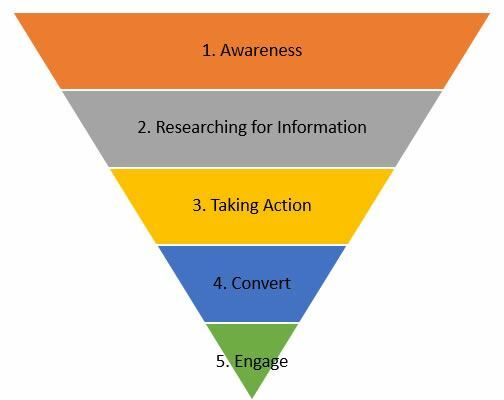 The image below is an example of the conversion funnel, where people typically start at the top or close to it and move down towards the point where they convert (typically make a purchase). Bear in mind that not all people will move linearly down the funnel or even get to the point where they eventually convert. It is also the case that this journey represented below takes place across multiple websites and the time taken to navigate through it can take hours to months. Awareness: This is the largest group of people in the funnel and is the only phase that does not necessarily relate to specific search terms. This represents people becoming aware of your products of service (even if they are not aware of your business specifically). Research: The research phase represents searches, typically quite broad, where someone is searching for information pertaining to a range of products. For example; someone searching for a new car, in this phase, my be reading second hand car guides, watching videos on how to get a good deal when buying a car, etc. As such these search terms will be things like “what is a good family car” or “best car for mpg”, “2008 Toyota corolla review” etc. Product reviews often form a major part of this phase. People in this phase may end up moving back into the first stage after becoming aware of some new product that they previously had no knowledge of. Taking Action: In this phase the user is actively looking for a seller or a place to make a purchase. Search terms at this stage may revolve around looking at seller reviews, price comparisons, etc. People at this stage will likely already have had brand contact with the business that they will finally make a purchase with. Convert: This is the stage where someone makes the purchase and depending on how well this went they may or may not continue to the next stage. Engage: If the user experience has been very good, if they have received great service, a great deal or were pleased with some other component of the experience, they may engage with your business. This doesn’t have a search term class associated with it, as it represents people typically engaging socially with your businesses Facebook page or leaving a review. Engaged customers act as referrers to your business, enabling other people to enter the conversion funnel at different stages with a strong emphasis on using your business. Each stage (2, 3, 4) can all be met with paid ads and content that fulfils those needs. Identifying what search terms fall into what stages and what value they have is essential to online success. A good example of this is looking at the assisted conversions metrics, which show what keyword assisted in the path to conversion but didn’t necessarily end up as the last click conversion. For each of these keywords you can look at the search terms and build a model relevant and specific to your business.